ANAHEIM, Calif. (AP) — The Anaheim Ducks broke up their successful goaltending tandem Monday, trading Frederik Andersen to the Toronto Maple Leafs for two draft picks. Anaheim acquired the 30th overall selection in Friday’s draft and a second-round choice in 2017 for Andersen. 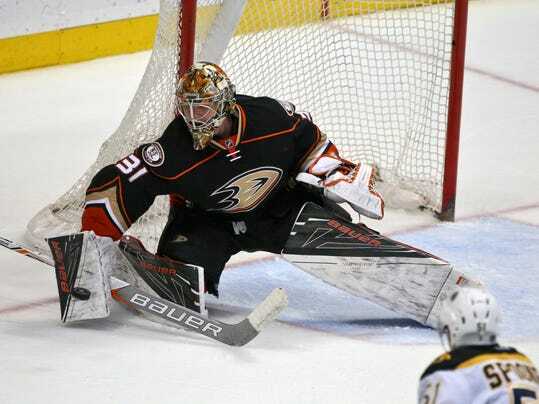 He has shared the Ducks’ crease with John Gibson for parts of the past two years, including most of last season. With Andersen playing in 43 games and Gibson appearing in 40, the goalies combined to earn the Jennings Trophy for the NHL’s lowest goals-against average. But with two starter-caliber netminders expecting paychecks and playing time commensurate with their abilities, Ducks general manager Bob Murray knew his embarrassment of goaltending riches couldn’t last.